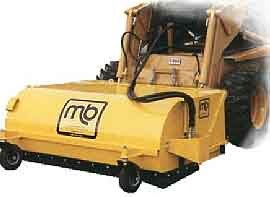 M-B Companies, Inc.r Pickup Broom attachment allows equipment operators to utilize skid steer or articulated loaders for street sweeping. The front-mounted pickup broom comes with sweeper, bucket and quick-attach mounting hardware. A hydraulic drive motor powers a broom that sweeps dust, gravel, stones, leaves and other debris into the bucket. The brush speed is variable up to 180 RPMs. Rotation is engaged by loader's auxiliary hydraulics. Loader arms control the lift and dump features. The loader's bucket can be emptied without the removal of the sweeper. The broom attachment is completely covered by a steel hood and supported by two 4-ply caster wheels. Caster wheels rotate 360° for maneuverability and allow the broom head to follow uneven ground contours for maximum debris cleanup. Brushes are available in 48-in., 60-in. or 72-in. lengths. Optional equipment includes sprinkler system and gutter broom.